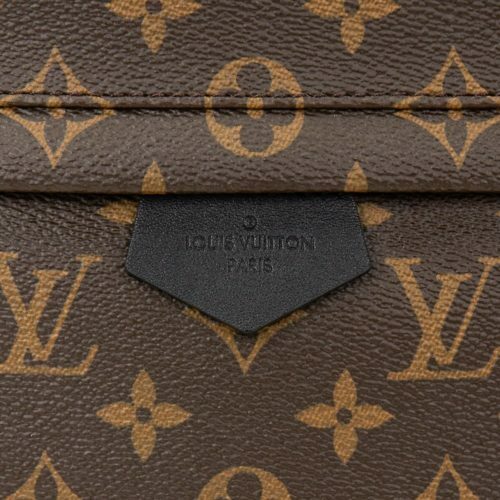 Louis Vuitton always manage to pull off the difficult balancing act of satisfying a thriving curiosity in monogram products while wooing high-end consumers with exclusive leather options. Under the creative direction of Nicolas Ghesquiere, the brand has made some striking changes in the leather game. The Louis Vuitton Palm Springs Backpack is at least one bag by LV that will capitalize greatly on the increased interest. 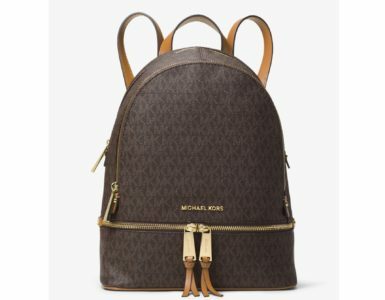 This backpack manages to take the ubiquitous LV monogram and makes it feel fresh without making significant changes. 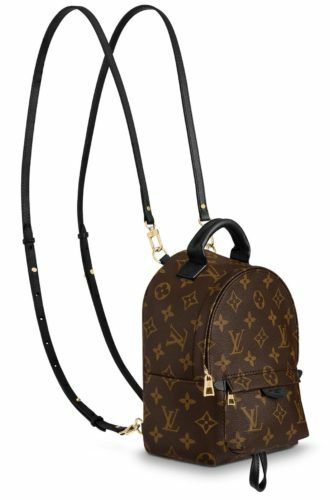 If you’re scouting for a trendy, functional, and high-end luxury backpack that will fuel your weekend trips and town musings, then this Louis Vuitton backpack will narrow down your pursuit. The chic and timeless design of this LV backpack will woo your inner shopping spirit. The handy functions and versatility appeals to practicality seekers. The combination of fashion and usefulness raises the popularity of this mini backpack to the next level. Urban nomads can enjoy the spacious interiors and high-quality leather while fashion buffs can drool on its distinctive house detailing. This Louis Vuitton backpack has all the multi-functional and trendsetter features that will give you a credible backpack for your journey. This backpack also features on our list of the 10 best mini-backpacks of 2018. 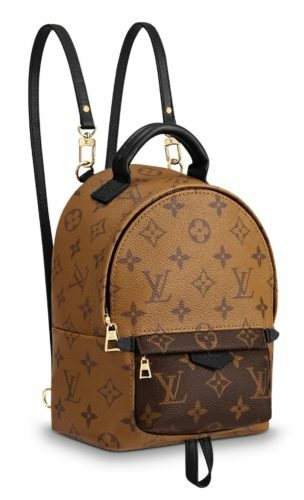 This Louis Vuitton backpack is stripped of the beige vachetta leather trim (present in most Louis Vuitton monograms) and a new leather is introduced. The black leather feels plush and sporty, all at the same time. This combination is huge in seasonal fashion and adds a refreshing touch to the monogram. The exotic leather pattern, trims, and engraved zip pulls together turns this utilitarian staple into an oh-so-covetable big city bag. Consumers who couldn’t buy a designer bag the last time monograms were trendy, can enjoy this monogram bag with a high-end designer touch. Without a doubt, there are many Louis Vuitton leather and canvas options available in the market for its elite consumers. This Louis Vuitton backpack is available in a monogram canvas as well as a reversed monogram canvas. These leather options are both unique and trendy, and will be a great addition to your backpack collection. The design of this Louis Vuitton Palm Spring Backpack is unique and unlike any other LV bag. This popping mini backpack comes with a padded leather top handle. This is a sturdy yet soft-to-touch leather hand grip that can withstand heavy weight without breaking. It is great for times when you need to pick up the backpack or simply carry it in a different style. The shoulder straps are padded, adjustable, and detachable for your convenience. This won’t irritate or strain the shoulders. This Louis Vuitton backpack has a top flap and double zip closure for extra protection. There is a leather scarf loop at the very bottom of the bag, side pockets, and one front zippered pocket to store the smaller essentials. The urban design of this backpack is intriguing and eye-catching. It will standout among a crowd of backpacks and will upgrade your fashion quotient to the next level. The interior? Well, it is the Louis Vuitton, so without a doubt, the backpack is made with premium quality. There is plenty of space to carry all your day-to-day things. From your scarf, makeup or purse to gadgets like your tablet or phone, this backpack can carry it all brilliantly. The interior is made using a resistance nylon fabric that will keep your belongings safe and sound, even when the bag bumps or falls. There is also a patch pocket for easy organization of cards and cash as well as an exterior pocket for extra space, so that you can put all your grab-and-go things in short reach. The presence of luxury and style oozes out of every inch of this magnificent Louis Vuitton Palm Springs Backpack. The black interiors perfectly match the monogram leather on the outside. The dual zippers open and close with ease and offers ample of security in case the bag falls. The gold accented hardware beautifully compliments the subtle hues of the leather and monogram. You’ll find the backpack a lot more striking when your eyes catch the golden zippers and marked pull zippers. 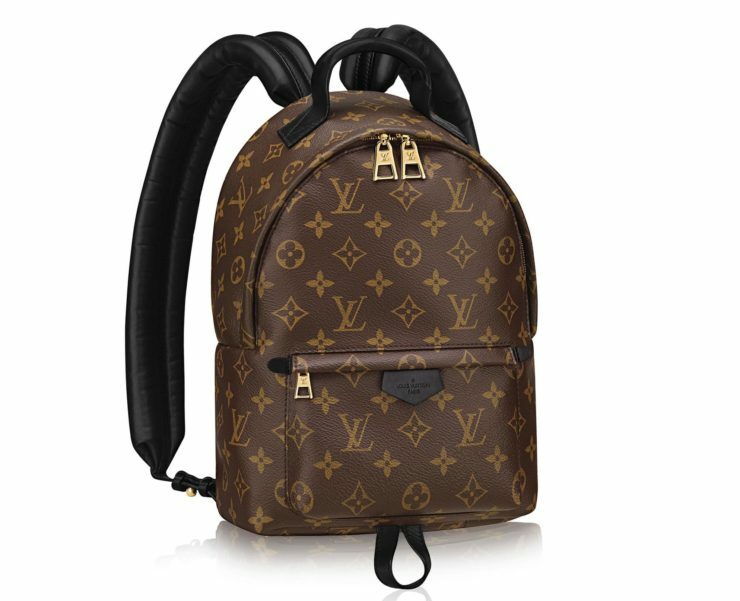 What more amazing things the LV can offer in a backpack? Different sizes! You can get this amazing Louis Vuitton Palm Springs Backpack in mini, PM, and MM versions. 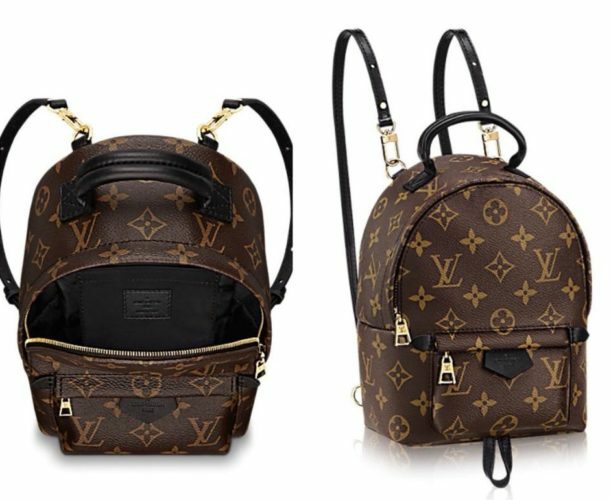 The mini LV backpack is the cutest and most adorable mini backpack you’ll see on the market. 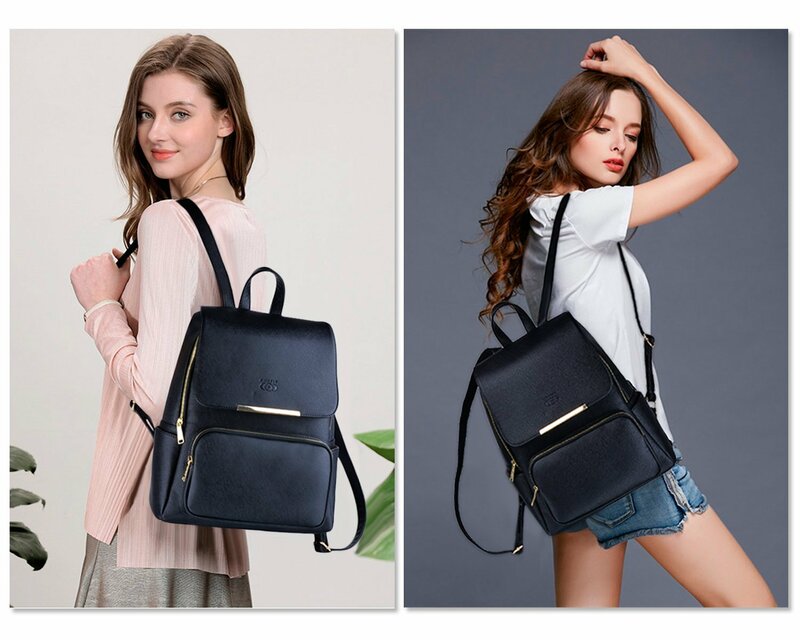 It has leather string-style straps attached, which you can also use as a crossover bag. The PM version of this Louis Vuitton backpack can hold a tablet and small books inside. You can also put water bottles and other essentials in the bag for your travels. The MM version of this LV backpack is the largest one available in the Palm Springs series. You can store a 13-inch laptop and other larger essentials inside this amazing LV backpack with ease. Take your pick carefully and go for the one that suits your requirements in the best possible way. Whether you’re into big brands or look for more practicality, this Louis Vuitton Palm Springs Backpack will feed both sides with excellence. This bag is a part of their Cruise 2016 collection and has already been spotted on the arms of A-list celebrities like Kylie Jenner, Rihanna and Chiara Ferragni. The Palm Springs range is an intelligent addition to the brand’s collection of bags. The bag is also well positioned within Louis Vuitton’s price structure. For a luxury brand, the Louis Vuitton Palm Springs series is a smart investment to your wardrobe. Offering both class and quality. Gift yourself one of the best backpacks in the market by getting your hands on this Louis Vuitton bag. 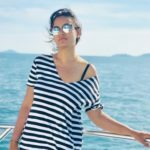 Barkha enjoys the ever-changing world of social media and digital marketing. When not obsessed with creative writing, she binges on delicious food and watches funny cat videos.